I live in Las Vegas, where the lights of the city obliterate the stars in the heavens. Despite the fact that the only cluster of stars I can identify is the Big Dipper, I consider myself a bit of a stargazer, and the appearance of a full moon over the horizon compels me every four weeks to send an excited text alert to my grown children, “Go up on the roof and look at the moon!! !” One time they ran up to do just that, thinking they would see something extraordinary, based on the exclamation points, I guess, only to discover the same old fat moon smiling and winking at them. A serendipitous glimpse of a single shooting star during Perseid season levitated me dripping wet and delighted out of the steaming spa one long ago night, so the promise of a total lunar eclipse visible from the West Coast on April 14 got me all a-tingle and I was determined to stay awake long enough to view it. On that coolish night I swathed myself in a blanket and settled into a wicker rocking chair in my back garden, gently rocking and fiddling with the focus of the binoculars around my neck. Overcome momentarily by melancholy, I imagined my father (a bit of a romantic himself) sitting and rocking next to me, keeping me company, the only person I could think of who would view the prospect of a lunar eclipse with the same level of excitement as I did; with the exception, maybe, of my children in their innocent childhood, when they still trusted in my amazing perfection. I imagined them snuggled together in the late dark night, cocooned in their super-hero flannel pajamas and sleeping bags, as I promised them a day of truancy from tomorrow’s school. The moon was big and bright, high in the sky just above the branches of the two bay laurels. The chirp of a solitary cricket and the quiet hum of the neighbor’s air conditioner were interrupted occasionally by the distant crescendo and decrescendo of airplanes passing over. The earth was taking its sweet time in its approach, and I dozed a little, surrounded by my invisible family, and dreaming for no particular reason, about holiday gatherings and recipes. I awakened to the whine and splutter of the landscape drippers, and, surreally, three poignant howls from a passionate dog, just as the earth took its first tiny bite out of the moon. For about an hour I rocked and gazed until the eclipse was total, and only then did I bid goodnight to the dissipating dreams of my loved ones and the beautiful blood orange moon. 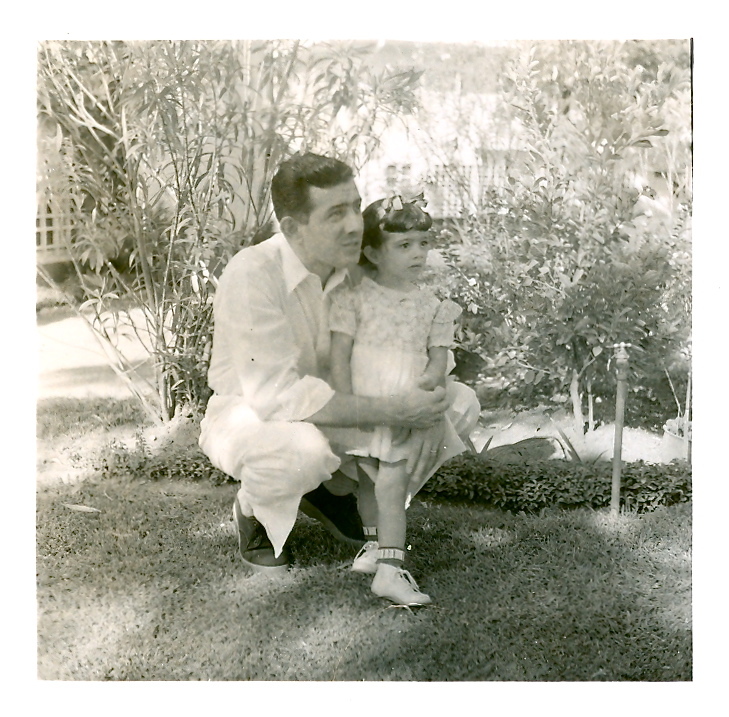 A beautiful and wistful account and the sweetest ever photo of you and your dad! I know he was right there with you as you admired the rare blood moon. I am forever in awe of my little sister’s eloquent muses of the past.